Straighten out the paperclip and grip it in the middle with the pliers. Bend down each leg at right angles to the plier jaws. Trim the legs with the wire snips so they are the same length. Bend the end of each leg in at 90 degrees as shown and clip each `ear' back to about 2mm in length with the wire snips . Remove any PCI cards from your AmigaOne and put the ROM puller in position across the diagonal of the ROM socket as shown. The `ears' should tuck in under the ROM itself. Note that the bevelled locating corner of the socket is at the lower corner of the socket nearest the edge of the board - that is the socket corner which is at the bottom of the picture. 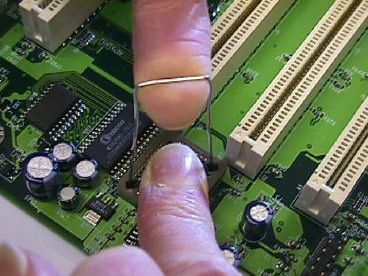 Finally pull the ROM out with the forefinger of one hand whilst steadying the ROM horizontally with your other forefinger. When inserting the replacement ROM, make sure the bevelled corner lines up with the bevelled corner of the socket.Place the ROM on the socket so that its metal `legs' line up with the metal contact strips in the socket. Then push firmly home so that the top of the ROM is flush with the top of the socket.